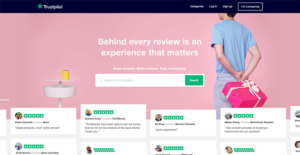 Trustpilot is a system which functions as a review community that connects businesses with their consumers and aims in building trust and transparency between the two sides. With Trustpilot, businesses are able to build a strong brand reputation as they are enabled to gather feedback from their customers, know their customers better, and showcase their brand, products, and services. Leveraging authentic reviews from real customers, Trustpilot helps promote consumer trust and confidence, resulting in large volumes of incoming traffic and better conversion rates. The system also offers traffic boost via paid and organic search. Trustpilot also enables both businesses and customers to interact. This functionality allows businesses to respond to both positive and negative reviews, reconnect and rescue dissatisfied customers, and enhance retention rate. Trustpilot gives you the platform to fully harness your customer feedback and comments, turning them into your most powerful marketing tool. People are now looking at product reviews from actual consumers as a gauge to whether make the purchase or not. Customer reviews provide consumers the human, emotional side of customer experience prior to making a purchasing decision. Product reviews from customers are effective and can easily influence one’s buying decision. With Trustpilot, businesses are able to collect authentic consumer feedback and reviews, make them accessible to other customers to help them make informed purchasing decisions. Transparent reviews help strengthen relationships between sellers and customers, resulting in strong consumer trust. Armed with reliable product information and experience, people have more confidence to make that purchase, leading to better business revenue and growth. Not all customers have positive experiences to share. With Trustpilot, you are able to identify customers who provided negative reviews and make the necessary actions to engage them and bring them back to the fold with assurances and incentives. You can also use these negative feedback to discover areas where your brands can improve and grow your client base. More than 120,000 companies from 65 companies have experienced significant business growth since getting reviewed by Trustpilot, including WordPress and Dior. Your business could be next. Every enterprise has different requirements and requires a software that can be personalized for their size, type of workers and buyers, and the specific industry they are in. For these reasons, no system can proffer perfect functionality out-of-the-box. When you try to find a software system, first be sure what you require it for. Read some Trustpilot reviews and ask yourself do you need basic functionality or do you need complex features? Are there any industry-specific features that you are looking for? Find the answers to these questions to assist your search. There are lots of aspects that you need to mull over and these include your budget, specific business requirements, your company size, integration requirements etc. Take your time, check out a few free trials, and finally choose the platform that offers all that you require to improve your firm competence and productivity. We realize that when you make a decision to buy Feedback & Reviews Management Software it’s important not only to see how experts evaluate it in their reviews, but also to find out if the real people and companies that buy it are actually satisfied with the product. That’s why we’ve created our behavior-based Customer Satisfaction Algorithm™ that gathers customer reviews, comments and Trustpilot reviews across a wide range of social media sites. The data is then presented in an easy to digest form showing how many people had positive and negative experience with Trustpilot. With that information at hand you should be equipped to make an informed buying decision that you won’t regret. What are Trustpilot pricing details? What integrations are available for Trustpilot?